Support the Amazing Sponsors of the 2011 Scripting Games! 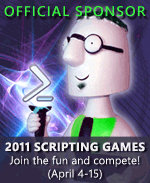 As you can imagine, a free event such as the 2011 Scripting Games would not be nearly as fun without the hope of winning cool prizes. And we’d like to wholeheartedly thank our sponsors this year. Please support our sponsors. They offer great products related to scripting, and we’d be honored to have you visit their websites to see what they have to offer.